No. 2A, Jalan Seksyen 1/23, Taman Kajang Utama, 43000 Kajang, Selangor, Malaysia. 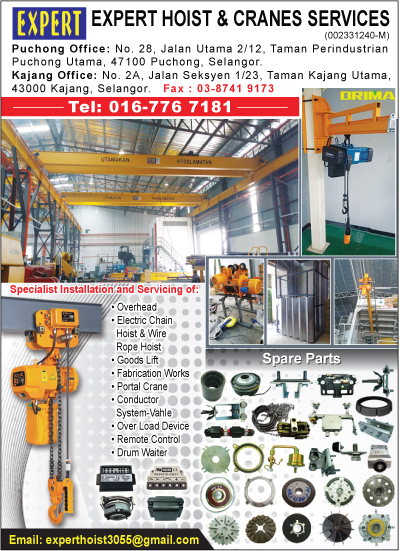 Expert Hoist and Cranes Services office and factory located at Puchong Utama. We have been in hoist and cranes industry for more than 10 years and throughout the years we have gathered a experienced and skillful hoist and cranes experts to serve customers. Due to these, most of our customers are likely return us with a pleasant feedback and recommend us to others. Furthermore, Expert Hoist and Cranes Services specialized in all brands of cranes, hoist & components modification and services. Apart from that, our area of expertise include of spare parts supply, services contracts, inspection services, refurbishment/upgrading services and on call services. Hence, Expert Hoist and Cranes represents the foremost comprehensive and best solution to any lifting application. Last but not least, we have had one mission of providing our customers with the best hoist and cranes products and services. With a solid team, we committed to doing what’s right for our customers as such we continue to provide great equipment and service to meet our customer expectations. Most importantly, we promise, when you partner with Expert Hoist and Cranes, you will be taking care by our team with a reliably and result driven manner.